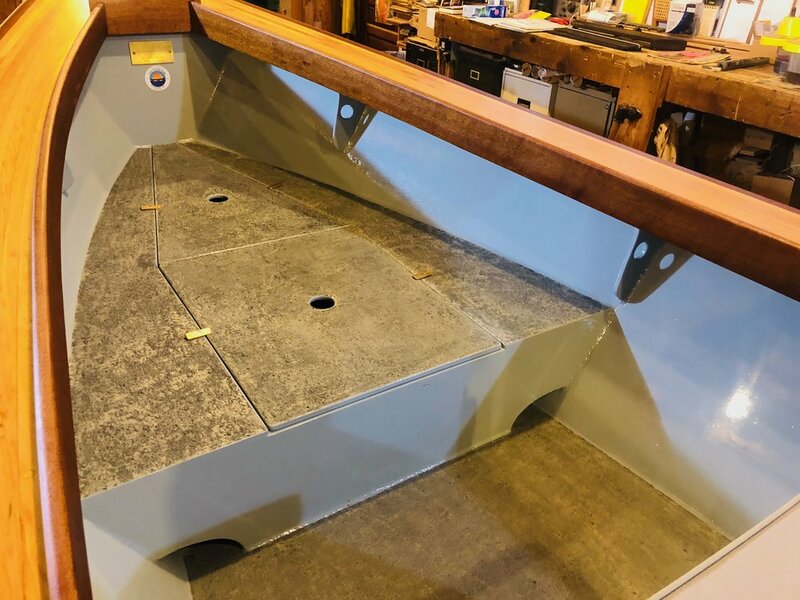 Here’s a photo album of the 4th Nauset Marsh Skiff, built in 2018. 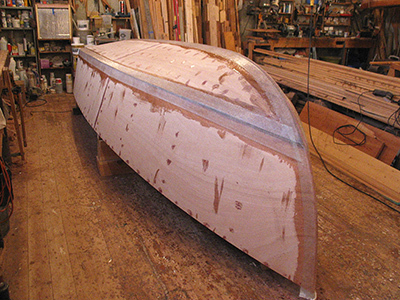 The 18’ Wide Guide was developed from a previous design that was never built. This design was developed for a fly fishing guide here on Cape Cod as a shallow draft fly-fishing craft capable of navigating the waters of Nauset Marsh and Nauset Inlet. The Wide Guide is a wider version of that design. 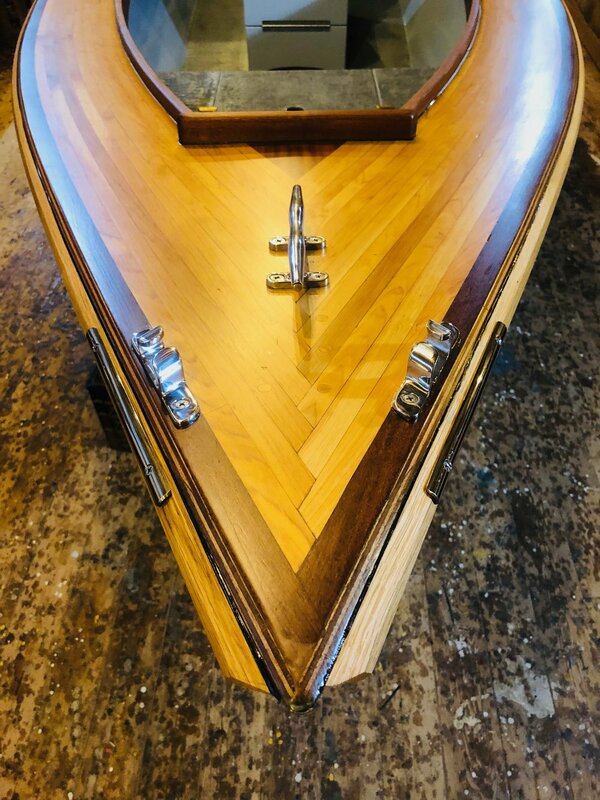 The boat was originally built as a bare hull for a client to finish, but he got sick and could not do the work. So I bought the hull back, finished it out as a launch, and ran a launch business in Wellfleet Harbor for 2 years in 2002-2003. 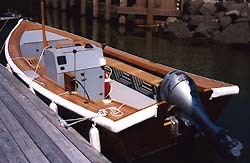 I closed the launch business and reconfigured the boat for sport fishing, as you see here. 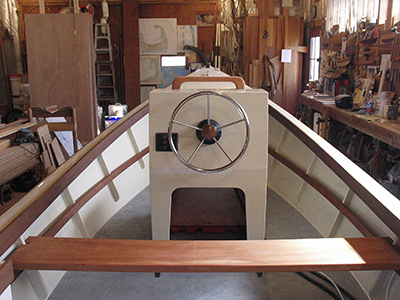 To convert the launch , I first removed the lettering, soft rub rails , benchseats , deck hardware and console. I faired the interior, grinding off the bench mounts and remains of the console. Then I rebuilt the console, including a gas tank box/seat on the front and installed it in a central position. 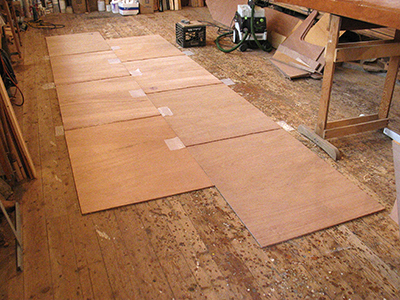 I removed the finish on the side decks and made repairs as needed, and removed the varnish on the transom. I installed and oiled the original white oak rub rails. 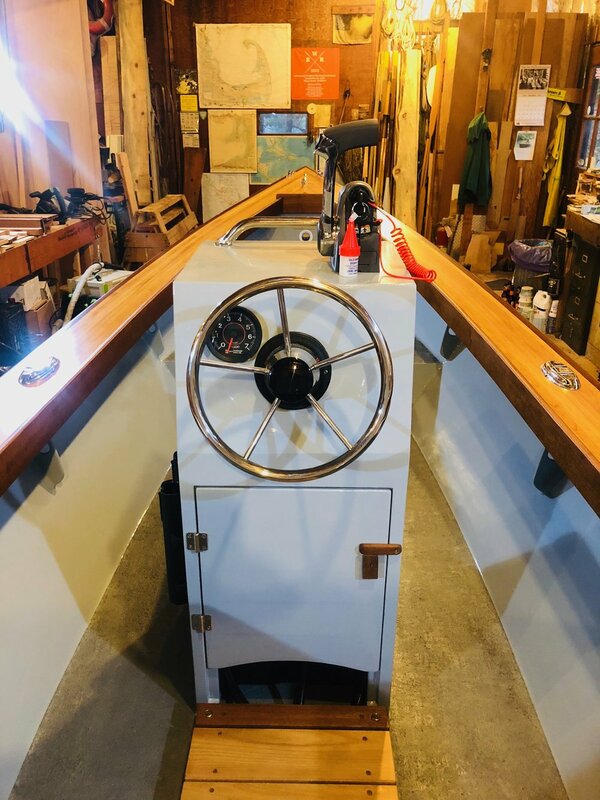 After all the woodworking and sanding was done, I repainted the interior and the topsides, oiled the side decks, and varnished the transom. I installed the deck hardware, 14 gallon gas tank, and a new Teleflex steering system. 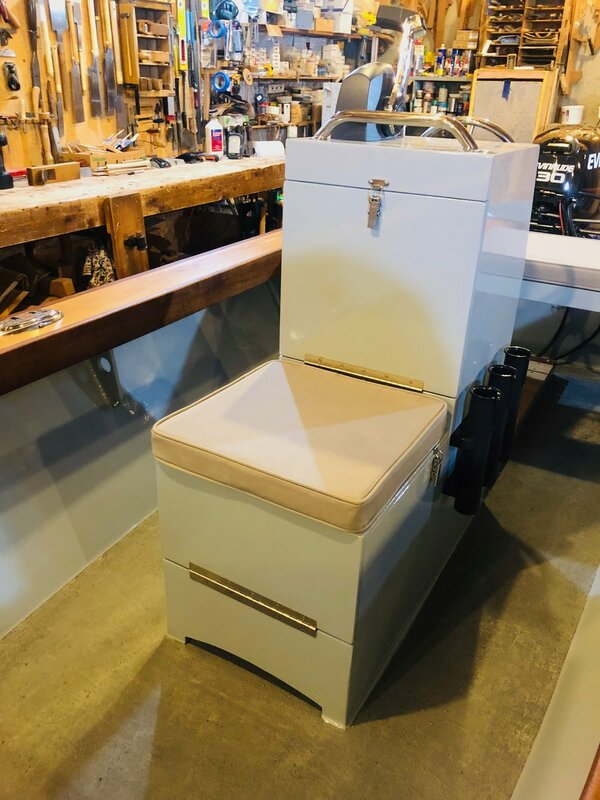 I replaced the 10 HP Honda motor with a new 50 HP Evinrude E-Tec outboard motor , including remote controls, tach, and hour meter. Total weight of the finished boat, including motor, about a half tank of gas, and normal boating gear, was 1320 lbs. I launched the boat on 8/26/04. Top speed by GPS is 30.7 MPH, at 5500 rpm, smooth water, one person aboard. It cruises on plane at 4200 rpm, at 20-22 mph. The BBB in her home waters. Artist's rendering of the BBB. 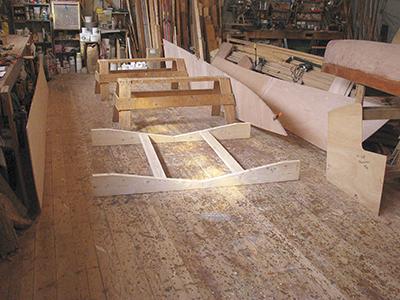 The Billingsgate Bass Boat design came to me one day in October, 2000. I was fishing off Billingsgate Shoals in my 18’ Simmons Sea Skiff, with a nice SW wind against the tide producing a good 2’-3’chop . The skiff was doing OK, but was feeling a little small. 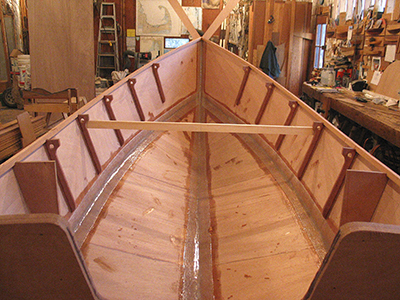 I liked the way the Simmons handles, especially in a following sea, so I thought , “How can I modify this boat to create a more comfortable fishing boat for Cape Cod waters ?” Rolling in the trough, a couple of waves came right up to the rail, so adding another strake in height was the first idea. Then some more beam came to mind. This would result in more surface area aft, which in turn would provide more planing surface, and be able to handle the weight of the modern 4-stroke motors, specifically the Honda 50. 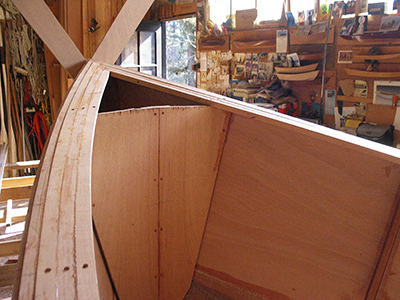 The Billingsgate Bass Boat was born. and custom built seats - 1,040 Lbs. fuel, and trailer - 1,740 Lbs.